Since Comestilblog nicely asked me, here is a Japanese-style Madeleine. 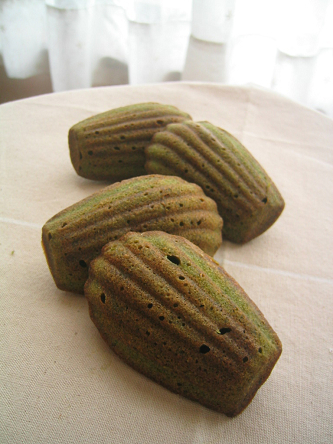 Madeleines are easy to make and can be come into infinite variations. Since I could not make it French for fear to bore everyone, i though that macha tea powder would be welcome! 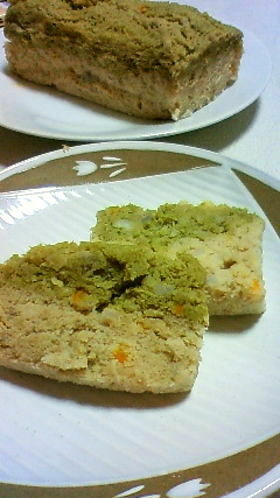 -Mix and sift flour, almond poder, baking powder and macha powder. Butter the madeleines molds with butter (not included in the recipe) and then sprinkle flour on the butter (not included in the recipe) for easy unmolding after baking. -In a bowl, mix egg and sugar gently (so as not to create any bubbles). -Add egg mixture little by little to flour mixture and mix. -Once you have mixed above, add little by little melted butter and mix in gently. -Wrap the top of the bowl and leave it inside the refrigerator for 1~2 hours. -Bake at 180 Degrees Celsius for 12~15 minutes (depending on the “charater” of your oven). -Let cool down completely before unmolding! Still in my Taro/Sato Imo mood, aren’t I? Today I would like to introduce a really simple pound cake recipe which includes taro and macha tea powder! Taro & Macha Steamed Pound Cake! 1-Cut the taro into practical-sized pieces and boil. Drain them thoroughly and mash into a smooth paste. 2-Beat into solid meringue the egg white, 2/3 of the sugar and the salt. 3-Add the rest (1/3) of the sugar to the mashed taro/sato imo, egg yolk and flour. Mix well. If the mixture proves a bit hard to mix, add water little by little until staifaction. 4-Add the meringue to the taro/satoimo and mix well. 5-Add the finely chopped lime zest and mix. Pour one half into a pound cake mold lined with kitchen paper. Add macha tea powder to the rest, mix and pour on top of the bottom layer. 6-Steam over a strong fire for 25 minutes. Makes for a very light and healthy dessert!